In the photo’s front row from the left are Maureen Miceli, Oswego Health community development assistant and committee member; Peter Cullinan, golf committee chair, of tournament sponsor Entergy Nuclear; Mike Quenville, Pathfinder Bank vice president Business Relationship Manager, and golf committee member; Don DeStefano, President of Diamond Roofing Company; Sam Doss, Project Manager, The Hayner Hoyt Corporation; Oswego Hospital Respiratory Therapist Susan Henning; Billy Alnutt, Oswego Health Interim Chief Information Officer; Renato Mandanas, Oswego Health Vice President for Medical Affairs; Bill Blum, Oswego Health Committee Member, Frank Kielb, Lincare; Chelsea Meehan, Rehab Resources/Little Lukes and Ken Martin, Oswego Health Committee Member. Missing from the photo were Jay Saternow, sponsor and committee member as well as representatives from Constellation Energy, Harris Beach, PLLC, and Mohawk Hospital Equipment. Oswego Health’s annual golf tournament will be held Monday, June 6th at the Oswego Country Club. 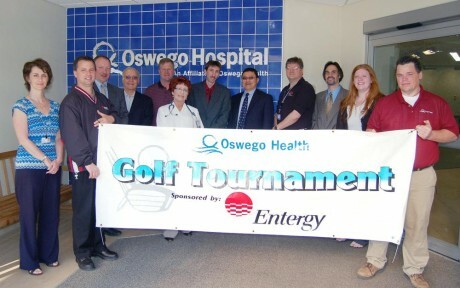 Tournament sponsor, Entergy Nuclear, joined the other major event sponsors recently for a photo. Proceeds from the golf tournament will support the purchase of a Puritan Bennett 840 ventilator. This new piece of technology offers superior comfort and delivers sensitive, precise breaths to critically ill patients of all ages.